Week 6 end: Mar 1-2: To kick back after a busy week we went to Harvard’s 23rd annual ‘Cultural Rhythms’ show, which celebrates the University’s rich cultural and ethnic diversity by showcasing the talents of over 40 student organisations. The students and faculty of the Harvard Foundation nominate an outstanding American artist to be honoured at the show as Cultural Artist of the Year. This year Herbie Hancock was presented with this award. The mix of talent was impressive, from Korean drummers to Peruvian dancers! There was even some step dancing from Harvard’s Irish Culture Society! On Sunday Owen and I attended the 2008 Social Enterprise Conference at Harvard Business School. A quick look at the schedule on the website shows how diverse the talks were. They ranged from using ICT for humanitarian responses, to micro-financing, to innovative solutions for homelessness. The high point of the day for me was Nicholas Negroponte’s keynote speech. He is the founder of the MIT Media Lab which is a world leader in media innovation, but more notably he is founder of the One laptop Per Child (OLPC) social welfare organization. OLPC manufactures XO-1 which is an inexpensive laptop computer intended to be distributed to children in developing countries around the world, to provide them with access to knowledge, and opportunities to “explore, experiment and express themselves” (constructionist learning). Nicolas mentioned some background information on the project, including that it was first thought of in 1968! He alluded quite a bit to the influence Marvin Minsky and Seymour Papert had on the origins of the work in general. 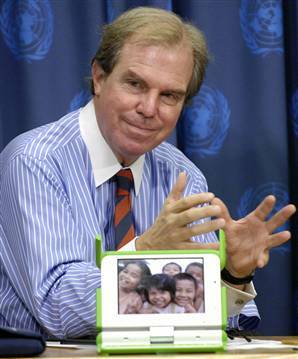 In 1999 he trialled a project in a school in Cambodia which provided a laptop to every 3-4 children. The children involved brought their laptops home not only to show to family and friends but because it provided their only source of light during the night! He recounted with embarrassment the initial prototype of XO-1 which included a wind up crank! The antennae on the laptop enable line of sight connections up to 2KM. Uruguay was the first country to place an order, which was quickly followed by Peru. Nicolas recounted walking into a Uruguayan cabinet meeting at which all the ministers were using XO-1s, which obviously appeared quite funny, given that the form-factor was designed for primary level kids!! XO-1 was designed with the aim of encouraging kids to actually open up the device and play with the hardware, which runs pretty much 100% contrary to traditional laptop manufacturers’ warranty requirements! An important point he made was regards the adoption/integration of upgrades and updates for XO-1’s hardware & software. Negroponte emphasised that it was more important for the price of the device to drop as new technology appears rather than incorporating this new tech and keeping prices unnecessarily high. The current price is $188, but the goal is to reach $100 in 2008. Instead wikis will be utilised to distribute free software, text books and various learning materials. Nicolas discussed some of the issues OLPC has had with Intel, which some may be aware of. It appears everyone’s’ favourite processor manufacturer doesn’t have much of a vested interest in the success of a project of this nature, no matter how altruistic its agenda appears. He mentioned some examples of how Intel intervened, hindered and collapsed negotiations with various governments of developing countries, during the initial stages of OLPC. This is obviously as a result of the use of AMD processors in the XO-1. It seems slightly childish that Intel would react so arrogantly. One result of their interventions with the government of OLPC’s first target country, is that about 60,000 children got Intel produced laptops, rather than 1,000,000 OLPC XO-1s. Check out this short article on Intel & OLPC. In my opinion, Intel have done themselves no favours whatsoever with this idiotic stance. I also managed to attend a couple of other talks, including one on ‘Innovative Solutions for Homelessness’ and another on the use of ICTs in providing humanitarian responses. I bumped into one of the founders of a small but very interesting project called Practical Small Projects. 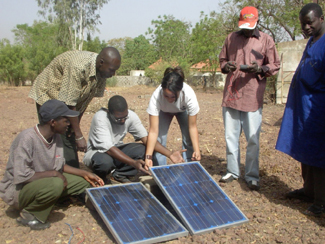 PSP facilitates the implementation of practical projects that require minimal financial and environmental resources, but have maximum impact and results in the developing world. Specifically they have installed numerous solar panels in Mali. Not only did they fund this, but more importantly they provided training to locals on how to service these units and also on how to build solar panels themselves! Take a look; it really is a great example of how a small but dedicated team can make a big difference with few resources.